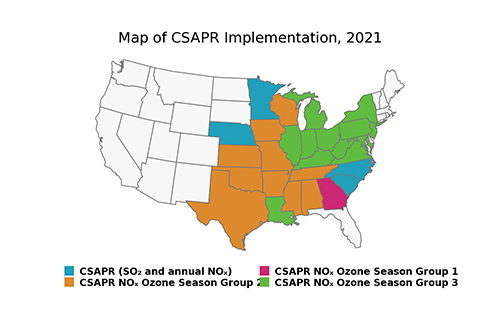 The Acid Rain Program (ARP) and the Cross-State Air Pollution Rule (CSAPR) are cap and trade programs designed to reduce emissions of sulfur dioxide (SO₂) and nitrogen oxides (NOₓ) from covered power plants. The Acid Rain Program was the first nationwide cap and trade program, with a goal of reducing the emissions that cause acid rain under Title IV of the Clean Air Act. The undisputed success of the program in achieving significant emission reductions in a cost effective manner led to the deployment of the market-based cap and trade tool to additional environmental problems, namely interstate air pollution transport, or pollution from upwind emission sources that impact air quality in downwind areas. Interstate transport makes it difficult for downwind states to meet health-based air quality standards for PM₂.₅ and ozone. EPA first deployed the NOₓ Budget Trading Program (NBP) to help northeastern states address the interstate transport of NOₓ emissions adversely impacting ozone air quality in northeastern states. Next, the NBP was effectively replaced by the ozone season NOₓ program under the Clean Air Interstate Rule, which required further summertime NOₓ emission reductions from the power sector, and also required annual reductions of NOₓ as well as SO₂ to address PM₂.₅ transport. 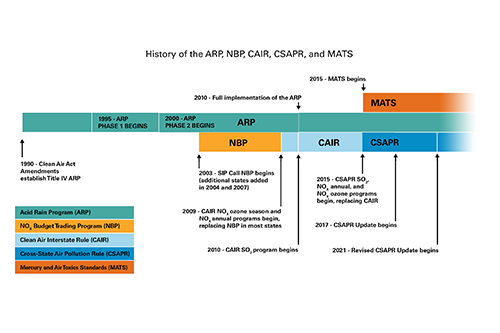 The CSAPR replaced CAIR beginning in 2015 to continue reducing annual SO₂ and NOₓ emissions, as well as seasonal NOₓ emissions, to facilitate attainment of the ozone and fine particle NAAQS.